1. EXPAND DIGITAL CAMERA STORAGE - Keple SD memory card (32GB) instantly add storage space to any camera with a SDHC card slot. Expanding the memory of your shoot cameras means you can capture more photos and video wherever you go. 2. RECORD HD VIDEO WITH YOUR DIGITAL CAMERA - 4K video - The advanced UHS Speed Class 1 (U1) and Class 10 rating for Full HD interface makes the card ideal for cinema-quality 1080p or even 4K video. These cards are completely compatible with digital cameras, camcorders, laptops, PC‘s and other devices that support the SDHC format and are capable of recording hours of full HD video. 3. QUICK TRANSFER SPEED – Keple camera memory catd is certificated Class 10 UHS-1 which means You can transfer photos & videos to PC or other file storage and edit your memories quicker thanks to the incredible 4x read and write speeds over traditional Class 10 SD cards. 1. EXPAND YOUR MOBILE DEVICE'S STORAGE - Keple Micro SD memory card (128GB) instantly add storage space to any device with a microSDHC card slot. Expanding the memory of your android / windows smartphone, Action Cam Camera, drone or tablet PC means you can capture more photos and video, carry more files, and enjoy your favorite music wherever you go. 2. RECORD HD VIDEO WITH YOUR MOBILE PHONE - 4K video - The advanced UHS-I U1 interface makes the card ideal for cinema-quality 1080p or even 4K video. Get your memories faster - Transfer and edit your memories quicker thanks to the incredible 4x read and write speeds over traditional Class 10 SD cards. These cards are completely compatible with mobile phones, laptops, tablets and other devices that support the micro SDHC format and are capable of recording hours of full HD video. 3. 3 in 1 BUNDLE - MicroSD USB card reader and SD adapter included. Transfer your media from your card to any computer PC or laptop. Simply insert MicroSD card into the adaptor or reader and plug it in into the your computer. You can also use microSD with SD adapter for Camera or camcorder. No drivers required. 1. 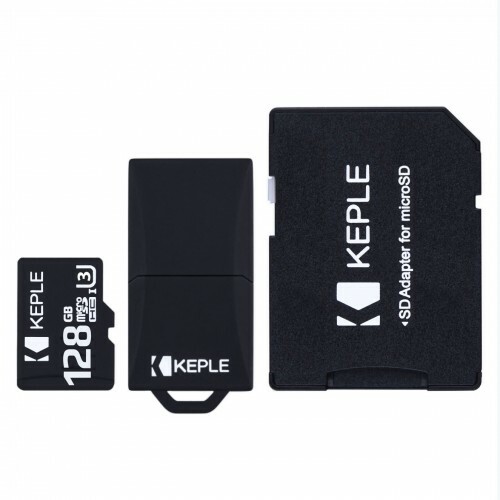 EXPAND DIGITAL CAMERA STORAGE - Keple SD memory card (128GB) instantly add storage space to any camera with a SDXC card slot. Expanding the memory of your shoot cameras means you can capture more photos and video wherever you go. 1. 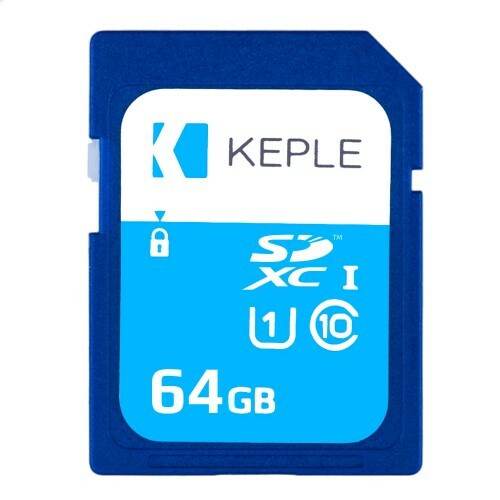 EXPAND DIGITAL CAMERA STORAGE - Keple SD memory card (256GB) instantly add storage space to any camera with a SDXC card slot. Expanding the memory of your shoot cameras means you can capture more photos and video wherever you go. 2. RECORD HD VIDEO WITH YOUR DIGITAL CAMERA - 4K video - The advanced UHS Speed Class 1 (U3) and Class 10 rating for Full HD interface makes the card ideal for cinema-quality 1080p or even 4K video. These cards are completely compatible with digital cameras, camcorders, laptops, PC‘s and other devices that support the SDHC format and are capable of recording hours of full HD video. 3. QUICK TRANSFER SPEED – Keple camera memory catd is certificated Class 10 UHS-3 which means You can transfer photos & videos to PC or other file storage and edit your memories quicker thanks to the incredible 4x read and write speeds over traditional Class 10 SD cards. 1. EXPAND YOUR MOBILE DEVICE'S STORAGE - Keple Micro SD memory card (64GB) instantly add storage space to any device with a microSDXC card slot. Expanding the memory of your android / windows smartphone, Action Cam Camera, drone or tablet PC means you can capture more photos and video, carry more files, and enjoy your favorite music wherever you go. 2. RECORD HD VIDEO WITH YOUR MOBILE PHONE - 4K video - The advanced UHS-I U1 interface makes the card ideal for cinema-quality 1080p or even 4K video. Get your memories faster - Transfer and edit your memories quicker thanks to the incredible 4x read and write speeds over traditional Class 10 SD cards. These cards are completely compatible with mobile phones, laptops, tablets and other devices that support the micro SDXC format and are capable of recording hours of full HD video. 1. EXPAND YOUR MOBILE DEVICE'S STORAGE - Keple Micro SD memory card (32GB) instantly add storage space to any device with a microSDHC card slot. Expanding the memory of your android / windows smartphone, Action Cam Camera, drone or tablet PC means you can capture more photos and video, carry more files, and enjoy your favorite music wherever you go. 1. EXPAND YOUR MOBILE DEVICE'S STORAGE - Keple Micro SD memory card (16GB) instantly add storage space to any device with a microSDHC card slot. Expanding the memory of your android / windows smartphone, Action Cam Camera, drone or tablet PC means you can capture more photos and video, carry more files, and enjoy your favorite music wherever you go. 1. EXPAND DIGITAL CAMERA STORAGE - Keple SD memory card (16GB) instantly add storage space to any camera with a SDHC card slot. Expanding the memory of your shoot cameras means you can capture more photos and video wherever you go. 1. EXPAND YOUR MOBILE DEVICE'S STORAGE - Keple Micro SD memory card (256GB) instantly add storage space to any device with a microSDHC card slot. Expanding the memory of your android / windows smartphone, Action Cam Camera, drone or tablet PC means you can capture more photos and video, carry more files, and enjoy your favorite music wherever you go. 2. RECORD HD VIDEO WITH YOUR MOBILE PHONE - 4K video - The advanced UHS-III U3 interface makes the card ideal for cinema-quality 1080p or even 4K video. Get your memories faster - Transfer and edit your memories quicker thanks to the incredible 4x read and write speeds over traditional Class 10 SD cards. These cards are completely compatible with mobile phones, laptops, tablets and other devices that support the micro SDHC format and are capable of recording hours of full HD video.